choir croak out them goodies: Rufus Wainwright at the Wiltern, February 12, 2008. 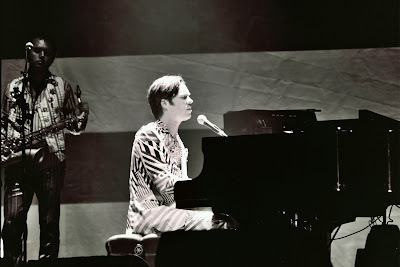 Rufus Wainwright at the Wiltern, February 12, 2008. 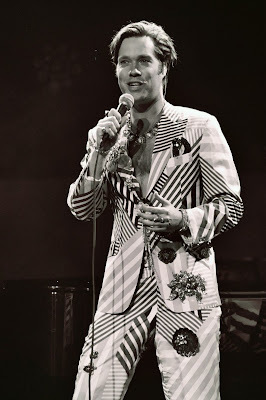 He began the “Ta” to his “Da” (the tour-concluding show at New York’s Radio City Music Hall that would occur two days later) in a fabulously gawdy suit, coated in striped patches and haphazardly-placed brooches. 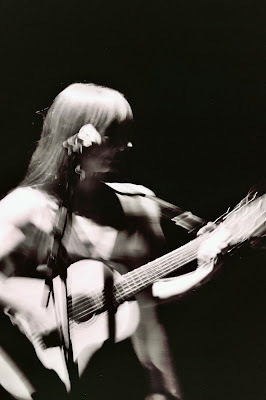 His band followed suit (har har), and altogether complemented a giant American flag backdrop – black and white with brooch “stars” that represented all that is respectively wrong and right with America. Save for intermission but including encores, Rufus Wainwright performed for two-and-a-half hours, using that necessary break for a costume change into lederhosen; musical efforts, meanwhile, began with the lush, like the frustrated “Going to a Town,” and concluded with an encore that saw a white robed-solo performance of “Poses” lead into the diva himself breaking into lipstick ‘n heels Judy gear, lip-synching to “Get Happy” while his backing band literally tumbled over one another in choreographed fun. There’d been a prior Judy Garland tribute, of course, the pairing of “A Foggy Day” and “If Love Were All,” which Wainwright called the “best song ever written about the perils of celebrity.” His banter was top notch and expectedly risqué, even eliciting a few groans after “Matinee Idol,” at mention of a recently-deceased Heath Ledger. As with both Ledger and “Matinee Idol” subject River Phoenix, he noted, “Once they play the gay boy they die.” Groan. 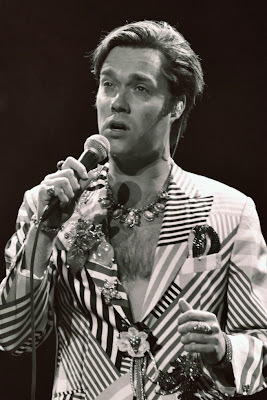 But Wainwright’s campy humor and style are matched by a flawless voice, and the real highlights of the night were the fairly solemn “Leaving for Paris,” written for but not included in Baz Luhrmann’s Moulin Rouge, and an unplugged cover of John McCormack’s “Macushla,” during which his voice carried beautifully even without the assistance of a microphone. 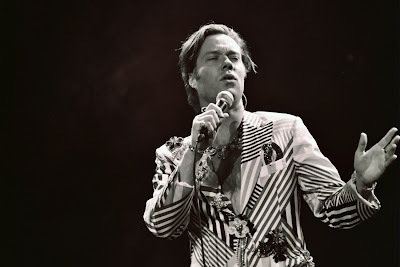 At a time when Britney and Amy are plagued by media and addiction, Rufus Wainwright is, quite frankly, the most reliable diva we’ve got. Someone managed to film "Macushla!" 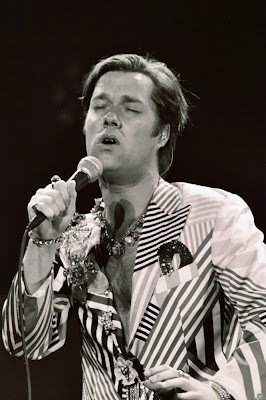 after the show last night at Radio City i scurried on the net in frantic and failed search for "matinee idol", for it was nowhere to be found. thank s.